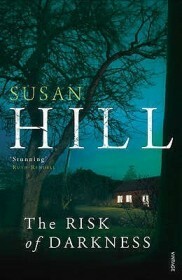 Susan Hill is one of those author's I've always meant to try. Curious what your favorite book by her is? Hmmm, after readying what you said, I am a bit surprise that you managed to read the whole book! I have her Bio.. if I ever get to it.! !I am already way behind in my reading. I guess it is what it is. I do finally have a book post to put up though!! Cath, as it's been a while since I read this book, I went back and read my thoughts on it. I noticed that in my review I said that I wanted to 'smack' Simon a few times. And I also said the book made me want to go hug my daughter. When I read this one and several others, I was on a series binge - listened to them on audio and the narrator was very good. I also said this book was quite dark. Susan Hill seems to be an interesting person - maybe not one I'd want to be best friends with. Ha! I just commented at Kay's blog re stopping reading this series after about 5 books. I became frustrated with some aspects of the books. But I loved the first few and I am sure you will continue to enjoy them. She certainly creates characters that the reader gets invested in. Like Diane (above), I'm a newcomer to Susan Hill's work. I'm really interested in "starting off" with her, and am wondering what you'd recommend. And I know what you mean about child abduction. For me, sometimes, there's only so much I can take on. I read a lot of Susan Hill's Simon Serrailler books years ago. I was very keen on the earlier books. This was before I wrote my blog so I have just a few notes about them - for this one I noted that it was 'good, sombre, sad, mysterious'. I read books 4-7 later - and then stopped after starting and not being able to continue book 8 as I couldn't stomach the child abuse. As you say they don't make comfortable reading, but they are page turners. definitely 'dark' and gloomy books! I hope you're reading something lighter and more cheerful now. I think of Serrailler as 'Sir Ryer' - if that makes sense - that's the way I say it to myself any way. I keep browsing through this author's books whenever they are donated into the charity shop and she has been recommended so many times by fellow bloggers, I just can't understand why I haven't read her before. I must admit that I would probably choose one of the stand alone novels over this series, which is now up to book 10 coming out this year, as it really feels that I would need to go right back to the beginning, to understand this complex character. There have been several books out lately were child abuse and abduction have featured as storylines and I have quite a few in my TBR pile. Whilst these darker aspects of crime / thriller writing don't really bother me to any great extent, I think that if I were you, I would probably be looking for something much lighter to read next. Thanks for such a thoughtful and honest review. Diane: My favourite book by Susan Hill would probably be The Magic Apple Tree which is a non-fiction book charting a year in her previous Oxfordshire home. But her ghost stories are excellent too, especially The Woman in Black. Plus she has two books about books out too, both wonderful. Pat: What's the 'Bio' (Biography?) book you have called? I didn't know she'd written one. Kay: Yes... a really dark book but I suspect the whole series is? She doesn't shrink from tackling very serious subjects. I agree with some of her opinions but others I definitely do not. But her writing is sublime. Tracy: I can see why you became frustrated with aspects of this series. Possibly the same aspects as me. Judith: It's difficult to advise on a starting point with an author whose work is so varied... it just depends on what you fancy trying. She has two books about books which I adore, Howards End is on the Landing and Jacob's Room is Full of Books. She's also a noted ghost story writer, the best probably being The Woman in Black. Margaret: 'Dark and gloomy' describes the series very well. Superbly written though which probably is why they're so effective! I think you probably have the right pronunciation for Serailler, but I can't help reading it as Ser-al-ier which is miles off. Never mind. Yes, thank you, I've just started Aoife's Chariot by Katherine Pathak, crime and family secrets in the Western Isles of Scotland. Whizzing through it on my Kindle. Yvonne: Susan Hill has written such a lot and in different genres that it's hard to advise on which of her books to read. Her ghost stories are excellent, but she also writes some wonderful non-fiction, especially her books about books. Yes, I've chosen a much lighter book for my next read, I'm in Scotland on a wonderful island in the Western Isles.